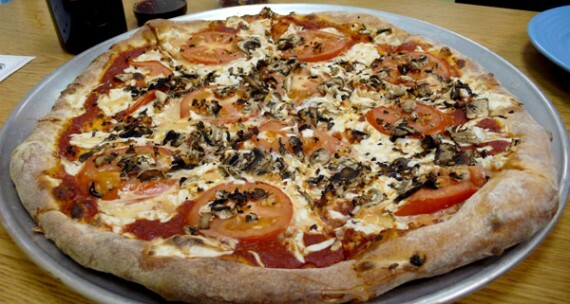 quarrygirl.com » Blog Archive » The Best Vegan Pizza Yet! New in Downtown Los Angeles. It looks great and delicious pizza to eat. The additional add on top of the pizza is awesome. I wonder if I can get the pizza here in my place..or perhaps learning to bake one my own?! Lol. I am going tomorrow! I just decided that. Yay! I cry with cheesy joy! Life just keeps getting better all the time! 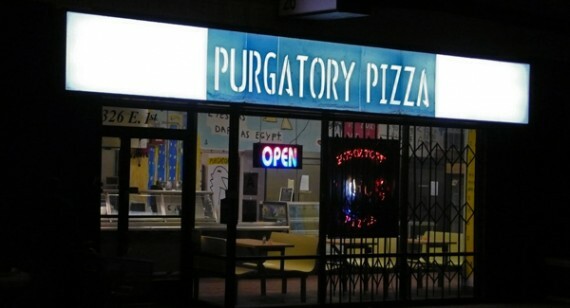 Man, maybe I’ll go to Purgatory for Valentine’s Day! Hahaha, I love the edited menu! this is like a mile from my recording studio! this will hold me and my clients over til doomies is back up and running ! thanks for the post. I want to thank Mr. Meaner and Quarry Girl for this most spectacular review. I’d really like to offer some tasty options for vegans. If any of you do come by Purgatory, ask for Kelley, (hopefully I’ll be there. Ask for Tad if I am not. (my partner)) Also let me know if you have any suggestions for us. Thanks! Happy for you all… and envious here in Tampa! Purgatory Pizza has been my favourite since we moved to E. 4th a couplea years ago. Sadly, we had to move, and while we are now back in the heart of downtown Los Angeles, we plan to move back into the delivery diameter of Purgatory Pizza, before the year is out. Yeah, it is that good! 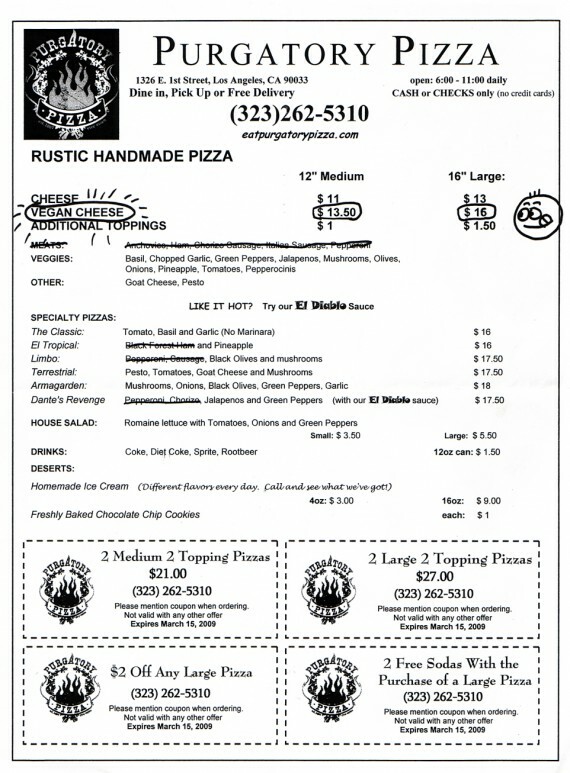 Very nice review and even though I’m a vegetarian, I do plan on trying the vegan pizza. It looks and sounds delicious. Just one clarification though, Purgatory is not in Downtown but Boyle Heights and more specifically the historic neighborhood of Aliso-Pico. I enjoy your site, thanks for all the reviews! Thanks for the heads up and I chime-in with chimatli with saying that it is in Boyle Heights & NOT Downtown LA. Ray’s in mid-town? Yeah, it’s pretty good, but the one on St. Mark’s is the one (of the three battling it out) that I pick. I usta walk up there round 7 in the morning to enjoy a wake-up slice, garlic knots and some beers before I stumbled round LES making trouble. Nevertheless, Purgatory is as good enough to the Ray’s of the west coast—now if we could just get them to be open from 6 a.m. until 5 a.m.! Why a sad vegan you ask? The big news being passed around in hushed, somber voices amongst L.A.’s veg*n foodies is the premature closing of most everyone’s favorite restaurant, Doomie’s. It was with heavy hearts that we read Doomie….